Can you feel the love tonight? This Saturday, December 8, feel the love and get serenaded by Sir Elton John at the Araneta Coliseum. For this one-night only rendezvous, I'm pretty sure that you would reminisce to his famous songs that inspired us to love and live. He’s out to take over the Big Dome on December 8 and every Filipino worth his musical salt is waiting for Sir Elton John to bring his Rocket Man concert in Manila. 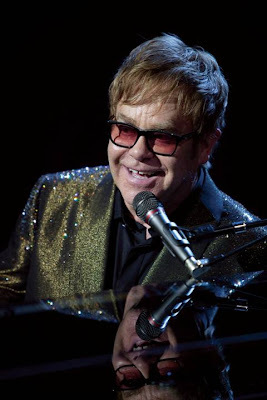 From his numerous awards – six Grammys, four Brit Awards, an Academy Award, a Golden Globe Award, and a Tony Award – to his knighthood for his services to music and charitable services bestowed upon him by nothing less than Queen Elizabeth II, Elton John has proved to the world why he’s hands down, one of the most successful music idols in history. Elton John is not just a mere English singer and song writer. He’s a rare personality that sparks a lot of interest along the way as he releases one hit song after another from the humble start of his career mainly because of his exceptional personality. The Rocket Man is not just famous for a long and ongoing series of hit records, he’s also quite popular for his thoughts as well. 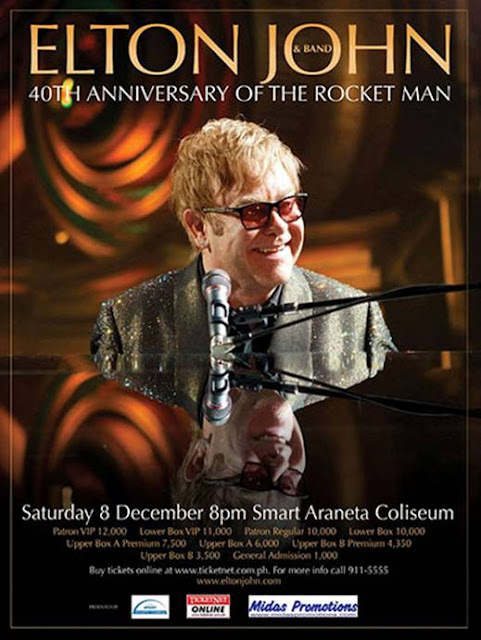 Get a look into the Rocket Man and his songs when Elton John invades Manila on December 8, 2012 at the Smart Araneta Coliseum. For tickets, you may log on to www.ticketnet.com.ph or call TicketNet at 911-5555. Elton John Live in Manila: 40th Anniversary of the Rocket Man Tour is presented by Manhattan Garden City. It is also brought to you by Midas Promotions and Araneta Center. Television partners are ABS-CBN and Solar Entertainment. Other media partners are Philippine Daily Inquirer, Manila Bulletin, Business World, Metro and Metro Society, Radio High, Crossover. Official hotels are Manila Peninsula, Crowne Plaza Galleria and Holiday Inn. Official Transport partners are H&M Transport and Joylong Van Philippines.